These numbers give a total of $363M and another book mentions $125M cumulatively before 2006. But a more recent powerpoint document shows that the total cumulative revenue is … $613M!! As a side note, in 2005, the Google patent gave proceeds of $336M following the company IPO. The 2004 and 2003 reports do not say the amount of the largest source of income whereas in 2002, it was “an unexpected $5.8M in one-time royalties” and in 2001, “for the first time in over 20 years, a physical science invention – an optical fiber amplifier – generated the most income”. As Lita Nelsen from MIT said (see my previous post), “Even nationwide, you can show that tech transfer is, at best, a lottery if you want to make an ability to influence [a university’s financial position]. The primary winners—not 100 percent of them, but damn close—are single pharmaceuticals. Because if a pharmaceutical hits the market, it’s going to be in the multi-billon dollar [range]. The equity is seldom worth a lot, unless of course you can follow up with preferred investments. But that’s not what we’re in the business of doing. Any university that counts on its tech transfer to make a significant change in its finances is statistically going to be in trouble.” Google was a big exception with the equity proceeeds whereas the patent around monoclonal antibodies or the Cohen Boyer patent are about pharma. Have a look at the next figure from the same powerpoint document. Interestingly enough I am reading a very interesting book (more when I am finished) which describes the early days of Silicon Valley and in particular the creation of the office of Technology Licensing by Niels Rimers. 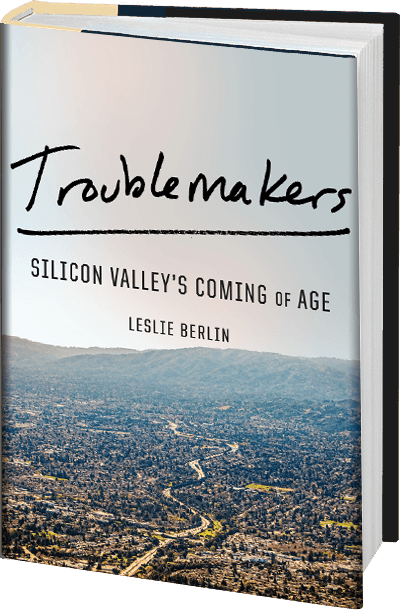 In Troublemakers, author Leslie Berlin extensively describes the Cohen Boyer patent. 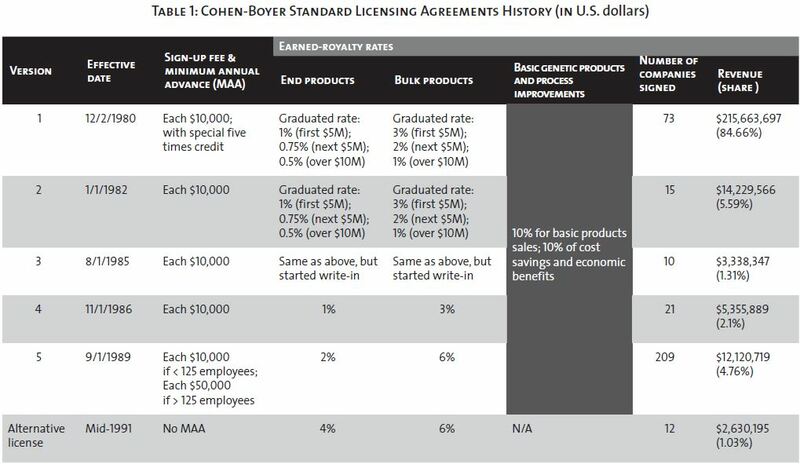 In note 32 (page 450), she describes the terms of the Cohen-Boyer license. 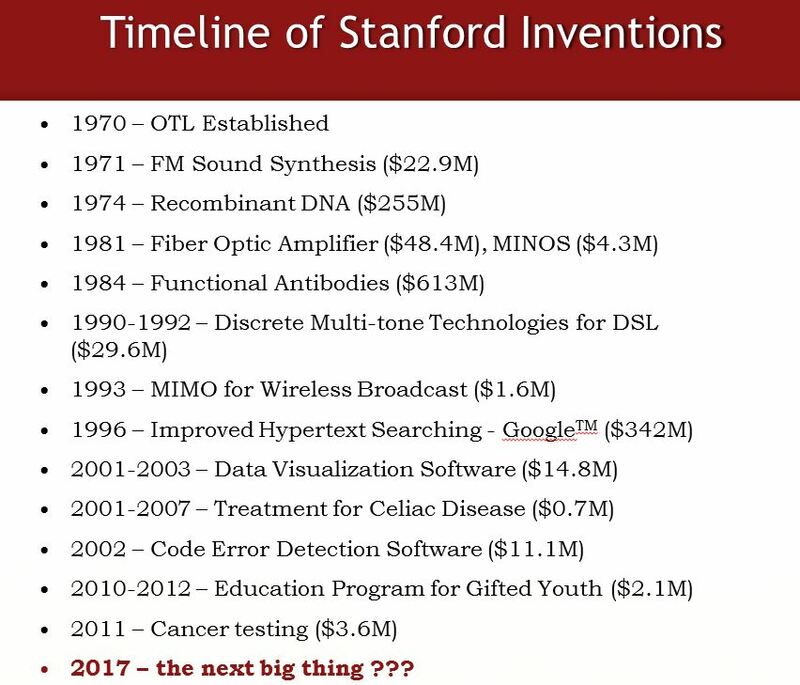 You can also find them in Lessons from the Commercialization of the Cohen-Boyer Patents: The Stanford University Licensing Program. 73 companies has signed for the initial $10k upfront payment, but “ten companies alone provided 77% (US$197 million) of the total licensing income” and 3 (Amgen, Genentech and Lily) provided close to 50% of the total. All this is well-known but I thought it would be interesting to blog about it today. This entry was posted in Innovation and tagged Licensing, Technology Transfer, Universities on January 16, 2018 by Hervé Lebret. I just read an excellent interview of Lita Nelsen who has recently retired as head of MIT’s Technology Licensing Office. 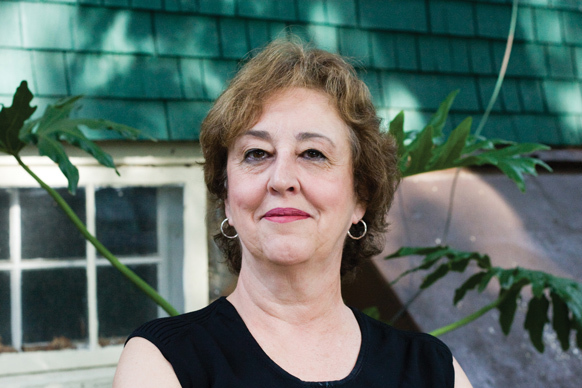 You should read the full Exit Interview: Lita Nelsen on MIT Tech Transfer, Startups & Culture. I was used to say that MIT was more conservative than Stanford just like the Boston Area has been known to be more conservtaive than California, but things change. So let me just mention a few extracts. 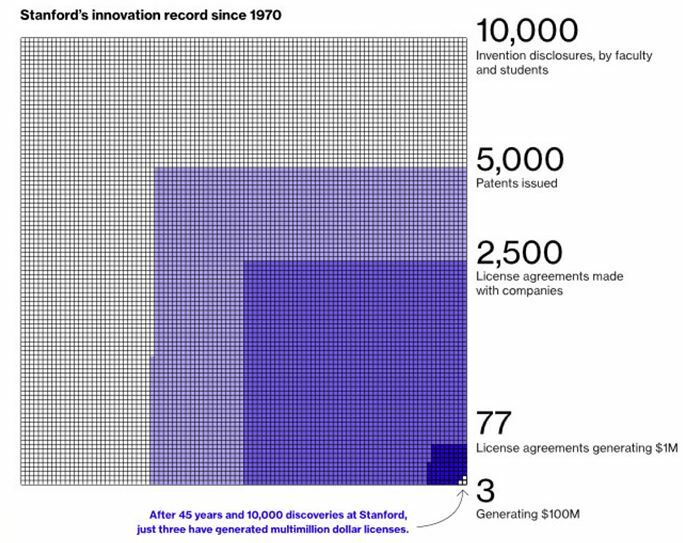 Patents are needed because the whole idea is if you’re going to get somebody to invest a lot of time and a lot of money, if you succeed you don’t want the other guy, the bigger guy, saying, “Well, thank you very much. Now that you’ve shown the way, get out of the way.” We are primarily using patents as an incentive for investment. [The Technology Licensing Office helps] start about 25 or 30 companies a year. God knows how many [other companies started on campus] go out the back door. No one fund could put that amount of sweat equity into all of them. Now imagine we have MIT’s fund, and I invest in company A, but don’t have the resources to do B, or maybe not C. Then I go with C to [an outside venture capital firm] and say, “How would you like my leftovers?” There’s a negative selection bias there for what we don’t invest in. So, better to let a level playing field for anybody who wants to play. But one thing any institution doing it has to decide is, are we primarily in it for return on investment? Or are we primarily in it for getting companies started that wouldn’t otherwise get started? You usually get a mixed message if you ask people which it is. And as everybody knows, when you get mixed missions, things get very hard to manage. How much equity does the Technology Licensing Office usually take when it spins out a company? Usually in the lower single digits, maybe a little higher if you have a software spinout. And it’s common shares. If it’s research-intensive stuff—biotech, things that take multiple rounds of funding—[our stake] usually gets demoted down to [tiny] portions. You make a little money; you don’t make a lot. Except in cases when the Wall Street bubble is totally irrational. Even nationwide, you can show that tech transfer is, at best, a lottery if you want to make an ability to influence [a university’s financial position]. The primary winners—not 100 percent of them, but damn close—are single pharmaceuticals. Because if a pharmaceutical hits the market, it’s going to be in the multi-billon dollar [range]. The equity is seldom worth a lot, unless of course you can follow up with preferred investments. But that’s not what we’re in the business of doing. Any university that counts on its tech transfer to make a significant change in its finances is statistically going to be in trouble. The problem with accelerators is the definition has become as broad and varied as incubators, which range from science parks to little projects within universities, so you don’t know what the word means until you dig in. But some of them are putting money into product development. Some of them are venture funds expecting ROI. Some of them are [funded] through donations, as we did with Deshpande and Harvard did with their accelerator. It’s going to be interesting to look at the mechanisms that people are trying. Because the problem is there: How do we get from the stage of which the university has done its research and maybe even gotten on the cover of Science magazine, to where somebody is going to invest in that ripening process before it actually turns into true product development, short-term product development? How do you get from the petri dish to full-scale clinical trials? You’ve got to get pretty far along before pharma’s going to do that for you. So people are looking both within universities and outside of universities as to how you fill the gap. now MIT, with its emphasis on innovation, is investing officially in training students in innovation and entrepreneurship, along with, not separate from, their intense technical educations. It’s not “you go and learn how to be an entrepreneur,” it’s you learn biology or chemistry or electrical engineering or computer science, but you also learn how entrepreneurship and innovation and moving technology out into the marketplace works—rather than having to learn that after you graduate. This entry was posted in Innovation and tagged Technology Transfer, Universities on January 12, 2018 by Hervé Lebret. The excellent Paris Innovation Review (formerly known as the ParisTech review) just published an interview of Jacques Lewiner (for the ones not knowing him, you may want to have a look at Jacques Lewiner about Innovation. This new article is entitled Research exploitation: catching up at a quick pace! This entry was posted in Innovation and tagged Start-up, Technology Transfer, Universities on February 23, 2017 by Hervé Lebret. Two Challenges of Technology Transfer – Part 2, Get to Know Your TTO. My second post about Technology Transfer (following the one about National Systems) is about the micro-economics of the activity. This is motivated by the very good Keys to the kingdom – subtitled What you need to know about your technology transfer office. Co-authored by 18 people from Stanford, Oxford, Harvard, the University of California in San Francisco and the University College London, the article describes what should know people interested in getting a license on intellectual property to create a start-up. The paper begins with “As an academic […]entrepreneur, you will face many challenges” and the second paragraph follows with “In addition, you will most likely have to negotiate with your university’s technology transfer office (TTO) to license the intellectual property (IP) related to your research”. What are these challenges related to TTO? they are written in the article in bold fonts as follows: Overcoming information asymmetries – Long negotiations – Inexperience – Lack of funding – Conflict of interest rules – Experienced legal counsel. This means that as a future entrepreneur, you should be prepared and ideally be knowledgeable about these. – A negotiation may be long (6-12 months, even 18 months) and one way to make it short is to take the proposed terms. – A way to mitigate inexperience is by “preparing an adequate business plan or strategy for your IP before approaching your TTO” or by “bringing aboard team members with prior experience in […] commercialization to improve your team’s credibility”. – Lack of funding can be partially solved by signing “license option agreements”. – Conflict of interest rules “exist to prevent academics from playing both sides of a technology licensing deal or devoting too much time to nonacademic obligations”. Furthermore, “TTOs represent the interests of the university (not the academic), yet the academic is technically an employee of the university. “Our policy is to never negotiate directly with the faculty,” says a US-based TTO representative”. You now understand why I said I was not convinced in my previous post about taking the UK as a reference. The US practice shows space for debate. You may check again my article from November 2013, where you will see that a typical deal is either 10% at creation or 5% after significant funding. Very rarely more. Again the authors mention “US founders often do not realize that some deal terms are negotiable, including upfront fees, option payments, equity, royalty payments, milestone payments, territories covered, field of use and exclusivity versus nonexclusivity” and “In the UK, licensing deal equity terms are often perceived as being non-negotiable, though this is not always the case. In fact, many institute policies explicitly state that equity terms are negotiable.” This may however make the process lengthier. My conclusion: any wannabe entrepreneur should read this short 5-page paper and be prepared to negotiate. I would love as much as the authors that universities and research institutes be fully transparent in their equity and royalty policies, though I am also aware of the possibly weakened position of universities which would do so. This entry was posted in Innovation and tagged Intellectual Property, Licensing, Technology Transfer, Universities on March 1, 2016 by Hervé Lebret. Two Challenges of Technology Transfer – Part 1, the National Systems. Two documents have led me to describe two types of challenges facing the technology transfer of academic institutions. – First, at a macro-economic level, the challenge comes from the various possible administrative structures, but also the complexity of the operations. 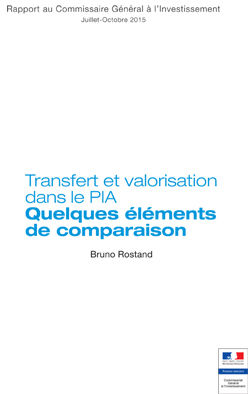 The report Transfert et Valorisation dans le PIA (in French) by Bruno Rostand compares the national policies of Germany and the United Kingdom to that of France. 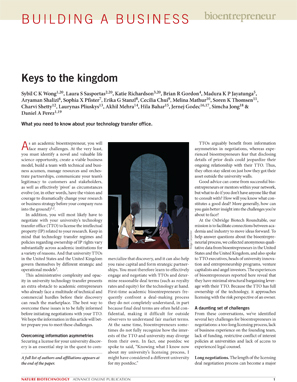 – Secondly, at the micro-economic level, the journal Nature published the article Keys to the kingdom with the subtitle, What you should know about your technology transfer office. I will come back to this in my next post. The report of Bruno Rostand addresses the challenges that France meets after having established regional structures for technology transfer, the “SATT”. He notes that Germany has built a similar system with its “PVA” in the Länder. In both cases, there is a goal of financial independence which seems difficult to achieve if not unrealistic, despite the existence of public subsidies. In Germany, two of these companies have even filed for bankruptcy in Lower Saxony in 2006 and Berlin in 2013. Why such difficulties? Because the returns on investment have not been up to the expectations. For example, approximately €10M euros have been invested each year in the form of public funds in Germany, but revenues remained much lower. In addition the regional structure has its limitations, as it is difficult to gain expertise in all areas of technology. The United Kingdom has a different situation. The state has been a marginal actor and technology transfer was organized either by universities (Cambridge, Oxford, Imperial College) or by private structures close to venture capital (IP group) which organically helped in structuring technology transfer. Through externalization, these organizations have become private organizations, which have become rich in financial and human resources. At Oxford, ISIS employs 80 people for £14.5m in revenue in 2014. Imperial innovation has been publicly traded since 2006, employs 45 people and generated a profit of £27M in 2014. Imperial innovation has expanded its initial base in collaborating with other universities. Finally, the IP Group has agreements with over 15 universities for a profit of £9.5M in 2014. The report shows very different philosophies, whether public or private, with profitability as an end or not, with an obvious entrepreneurial dimension in the UK. if the focus on start-ups is important, this will lead to different structures, including maturation funds and incubators. The report also shows that a licensing policy and a policy to support the creation of start-ups are very different. Finally, the new TT structures often have the sole responsibility of the development and maturation of IP, while research collaborations with industry remain the responsibility of universities. This separation could be a weakness when the two topics are linked. In the final part, Rostand shows the complexity of the challenges. One must first define the mission of technology transfer which can be for profit or not. Externalization seems to be a trend in the three countries, but it has its advantages and disadvantages. It also seems that there is a lot of instability and fluctuations in funding cycles, which does not help to make an analysis of the transfer tools. The report also addresses the issue of human resources (types of skills and experience), another subject which may be related to the available resources of these organizations. The only personal comment I make here is about my slight frustration at not having found in the report (which is extremely informative) an analysis of the US situation. The country of liberalism and private universities have very few external technology transfer structures, let alone for-profit. I have in mind WARF at University of Wisconsin-Madison – www.warf.org) while revenues of TT in the USA are significantly higher than in Europe. The explanation could simply come from a far more dynamic private innovation, regardless of all the systems in place. This entry was posted in Innovation and tagged Technology Transfer, Universities on February 29, 2016 by Hervé Lebret.